The kitchen of Transcona’s 185 Shady Shores Dr. is a spacious 23- by 16-foot space with a dinette area for four to six people, featuring a cappuccino-stained hardwood floor, granite countertops and cherry cabinets. 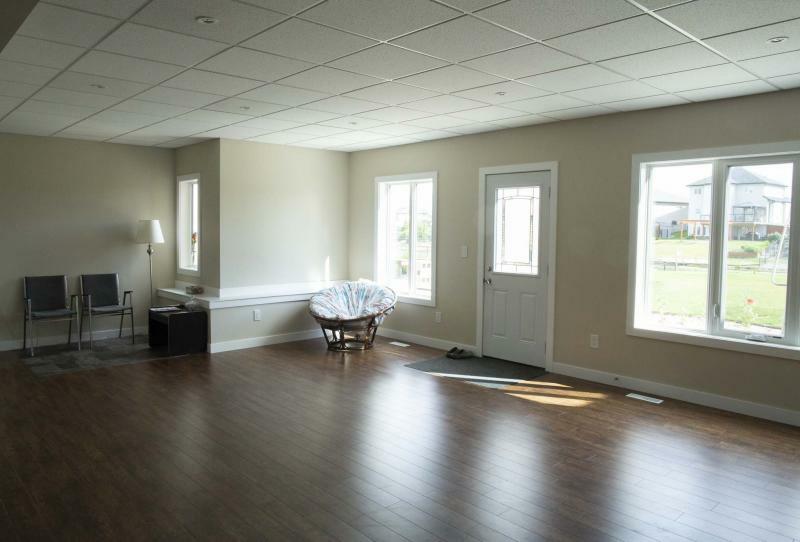 The finished, walk-out basement is bright and ideal for for spending time with family and entertaining. The two-storey home was built to the exacting expectations of its outgoing owner, who has an engineering background. It’s the stuff dreams are made of: a spacious, well-appointed home on a lakefront lot with walk-out basement. Yet, for most people, such a home is just that — a dream. After all, when you tally up the costs associated with building such a luxurious home — expansive lakefront lot, a footprint in excess of 2,000 sq. ft., plus the aforementioned walk-out basement — you’re looking at a price tag of $750,000 or more, depending on the home’s lot size and location. 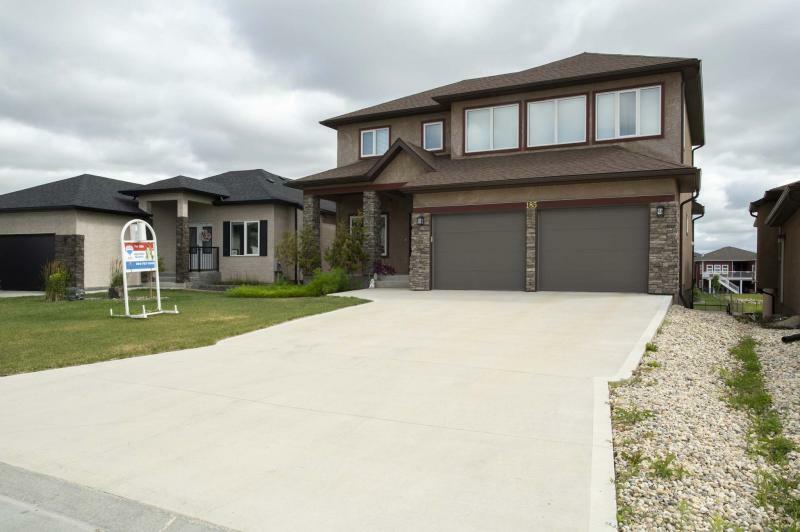 Jennifer Queen of Re/Max Professionals says she recently listed a 2,400-sq.-ft, two-storey home with walk-out basement in Transcona’s Waterside Estates that breaks that mould. "At $550,000, this (is) a great opportunity to get into a home with a walk-out basement in a wonderful area," she says. 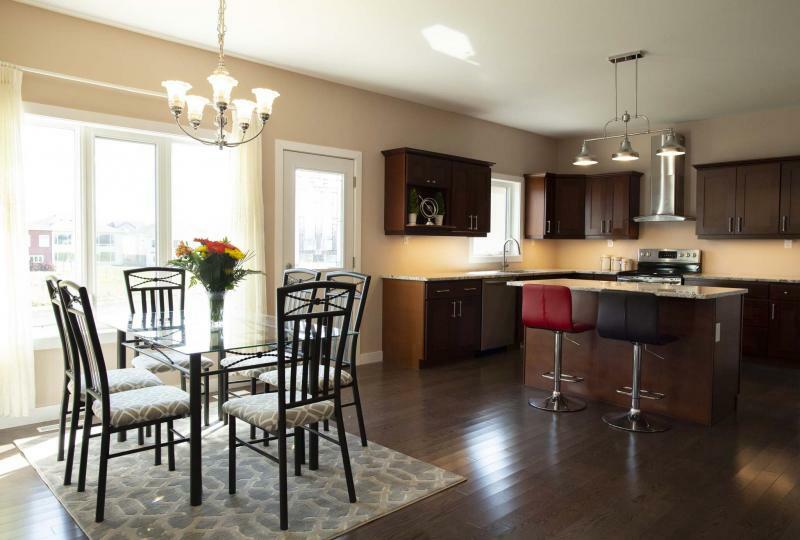 "Because this home is a bit further out in Transcona and was built in 2015, lot prices were cheaper when the home was built, as were construction costs. The result is a stunning, well-built home that offers incredible value." And while construction costs weren’t as high three years ago, that doesn’t mean the home wasn’t built to exacting standards. "The outgoing owner actually has an engineering background, so the home was built above standard specifications. Examples are extra piles for added stability, a structural sub-floor was installed over the structural wood floor downstairs and open beam trusses make for a state-of-the-art silent floor system." At the same time, great attention to detail was paid to the home’s layout and finishes, Queen adds. "Entering the home, you’re immediately greeted by a generous foyer that leads into an open-concept dining/living room/kitchen area with gorgeous cappuccino oak hardwoods. The formal dining room, which is defined by a pillared entrance, is to the left of the foyer before the living room and dining room." Because the home is 2,400 sq. ft., all three spaces are generous. The dining room is 13.4 feet by eight feet, the living room 15.7 feet by 9.5 feet and kitchen an expansive 23 feet by 16 feet (which includes a dinette area for four to six). "I love the kitchen — its island is just the perfect size, so there’s tons of room to move around and create," she says. "The finishes are gorgeous: cherry cabinets, granite countertops and, of course, the cappuccino-stained hardwoods. There’s also a mud/laundry room off the rear of the kitchen that holds a separate powder room. It’s a handy, functional space." Meanwhile, a large window over the double sink in the kitchen, window behind the dinette area, door to future elevated deck and huge picture window in the living room let in all kinds of natural light and stunning lake views. A double-sided gas fireplace set between the living room and dining room finishes off the home’s main living area perfectly, Queen says. "It’s a wonderful area to spend time in, whether you’re with family or entertaining. It’s bright, warm, spacious and tastefully finished. The views out to the huge, beautifully landscaped yard and lake are amazing." The home’s well-proportioned and navigable layout continues upstairs. As might be expected, there’s a bedroom wing that holds three generous-sized bedrooms and a well-appointed and spacious four-piece main bath. There’s also another huge, versatile space with a rear wall of windows set off to the left of the stairs, Queen says. "It’s space that the outgoing owners used as a family/media room, but it could easily be converted into a fourth bedroom if need be. It’s a space that gives family the flexibility they require for an extra degree of separation, or an extra bedroom." A quick tour of the bedroom wing confirms that all three bedrooms are bright and spacious. Fittingly, the secluded master suite caps off the area in functional style. "It’s a private retreat that offers a beautiful lake view through a big picture window on its rear wall, gorgeous tray ceiling, large walk-in closet with built-in storage and spa-like ensuite with corner jetted tub, five-foot shower and cherry vanity," she says. "It’s a great spot to relax at the end of a long day." Likewise, the bright walk-out basement is ideal for kicking back with a movie, or for entertaining. "The outgoing owners fully developed it with a huge rec room, fourth bedroom and four-piece bath — there’s also rich laminate plank flooring that tempers all the natural light that floods in through the windows on the rear wall. Lake views are spectacular and a patio door provides access to the beautiful yard." Queen says both the home and the neighbourhood it’s located in need to be seen to be fully appreciated. "Waterside Estates is a bit of a best-kept secret," she says. "It’s a quiet, family-friendly area with no through traffic that’s close to all kinds of amenities on Regent Avenue and that’s also close to the Perimeter. It’s well-built home that’s in like-new condition. You won’t find many lakefront homes with walk-out basements that offer the quality and value that this one does."